As we found out last fall, having a World Series game at your venue can generate large amounts of wireless traffic, on both cellular and Wi-Fi networks. But as it turns out, celebrating a World Series victory can generate even more traffic, especially when the celebration includes an on-field ceremony made for fan photos from the seats. 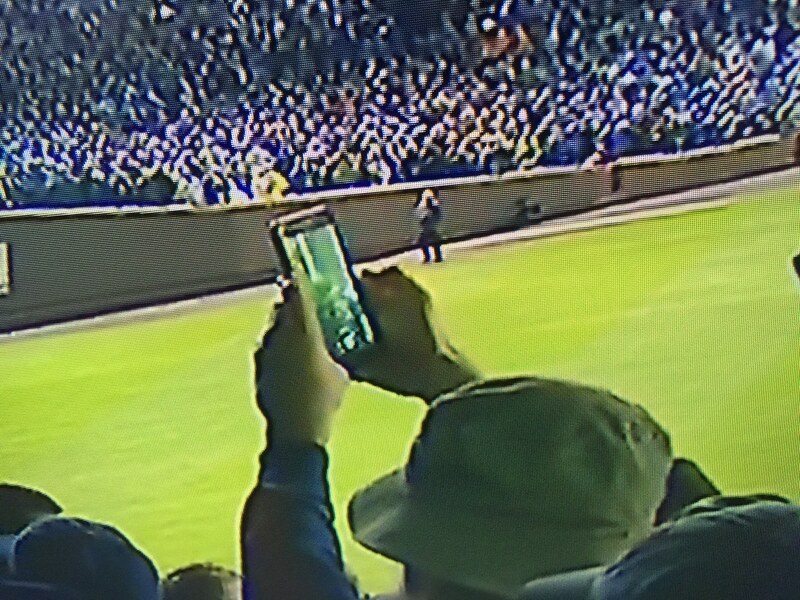 According to AT&T, Cubs fans at Wrigley Field for Monday night’s home opener used 1.4 terabytes of wireless data on AT&T’s cellular and DAS (distributed antenna system) in and around the Friendly Confines. 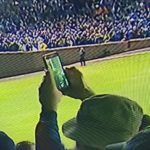 That was almost 400 GB more than the biggest AT&T usage report from last fall’s World Series, when Wrigley Field saw 1.006 TB of data used on AT&T networks for Game 3, the first game in Chicago. 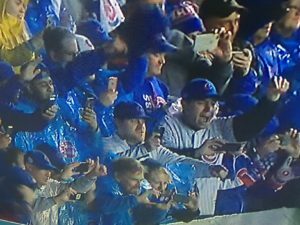 Before the Cubs and Los Angeles Dodgers played on Monday night, there was a lengthy rain delay where a packed house of fans was waiting for the Cubs to unveil their World Series and National League pennant banners. The flags, which were mounted on four poles at the back of the centerfield bleachers, became the center of attention when the entire Cubs roster still with the team from last season climbed up into the stands to each take a pull at hoisting the World Series champion banner aloft. 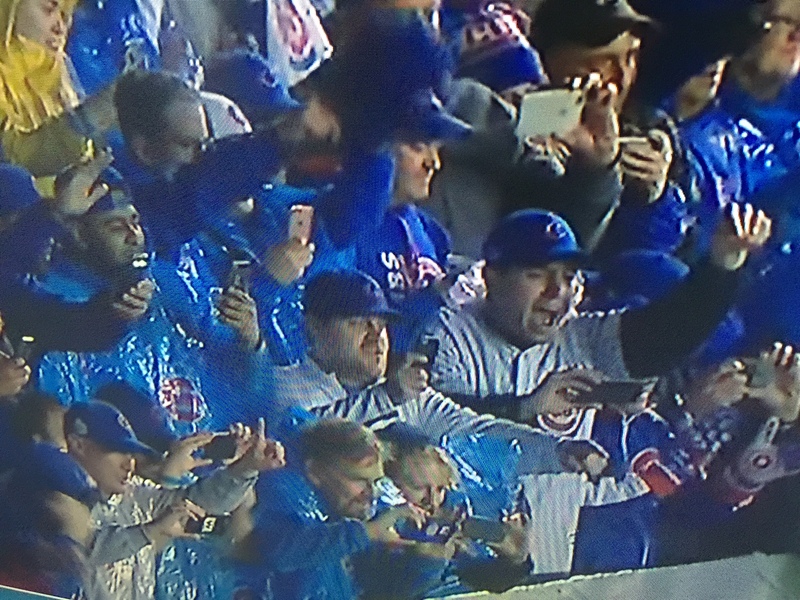 As you can tell by the pictures we snapped off the ESPN broadcast, it was a made-for-mobile-device moment, with some lucky fans able to get up close and personal photos of the Cubs players. After hoisting the banners the Cubs players emerged from the tunnels behind the outfield walls with the World Series trophy and paraded it onto the field, again no doubt attracting more of the photos that eventually were sent over the AT&T networks. It’s a lot of wireless traffic, but no doubt a problem any team in Major League Baseball would be willing to tackle each spring. Twitter’s NFL streaming debut fails on Tweet front; will AT&T and Verizon eventually dominate mobile device NFL streaming? The exciting national championship game Monday night between Alabama and Clemson also resulted in a big night for Wi-Fi and cellular usage at the University of Phoenix Stadium in Glendale, Ariz., with 4.9 terabytes of Wi-Fi data consumed, according to stadium network officials. 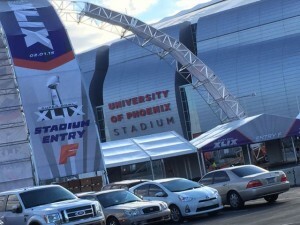 While the number didn’t set a stadium record — the 6.23 TB of Wi-Fi used at Super Bowl XLIX last February in the same venue is still the highest single-game Wi-Fi mark we’ve seen — the 4.9 TB used Monday nearly matches the total from last year’s inaugural College Football Playoff championship game at AT&T Stadium in Arlington, Texas, where 4.93 TB of Wi-Fi was used. It’s worth noting, however, that Monday night’s game had 75,765 fans in attendance, almost 10,000 less than last year’s crowd of 85,689 at the first playoff championship. So at the very least, Monday’s fans used more data per fan in attendance than last year’s game. 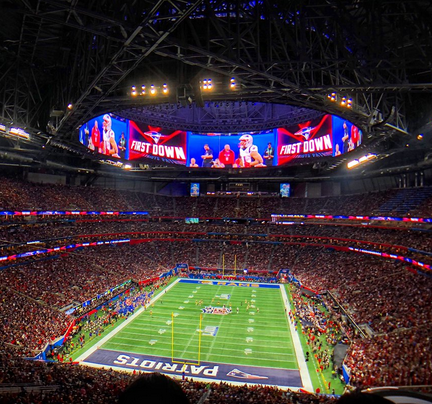 On the cellular side of things however, AT&T reported that data usage on its DAS network Monday night exceeded the total from last year’s Super Bowl, with 1.9 TB carried Monday to top the 1.7 TB total AT&T recorded at Super Bowl XLIX. UPDATE, 1/26/16: Verizon has followed up with a report claiming it had 2 TB of DAS traffic at the event. So for right now the wireless total from Monday’s game stands at 8.8 TB, a number that still might grow if we ever hear from Sprint or T-Mobile. 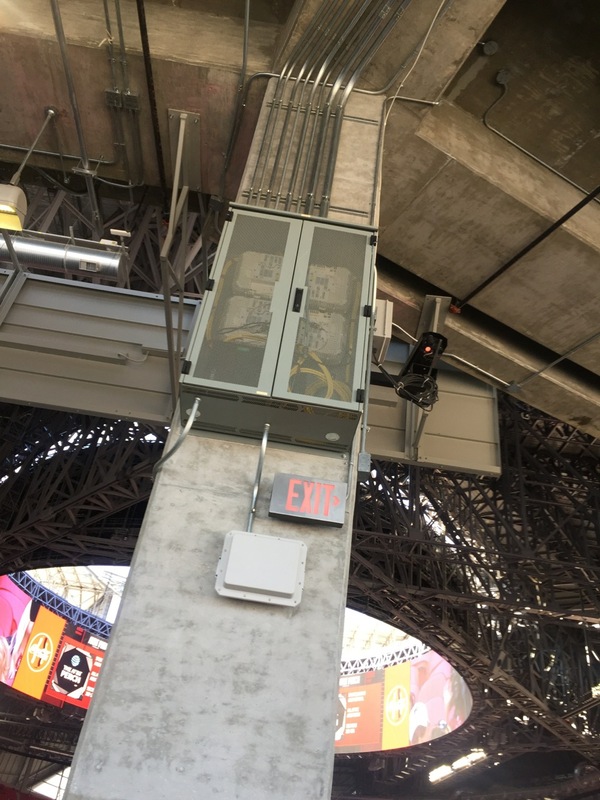 Mark Feller, vice president of information technology for the Arizona Cardinals, said that the University of Phoenix Stadium Wi-Fi network saw 23,306 unique devices connect Monday night, with a peak concurrent connected total of 17,297 devices. The stadium network also saw an additional 1.2 TB of wired data used Monday night, primarily from press and photographer Ethernet connections, Feller said. The 4.9 TB mark unofficially puts Monday’s game in the “top four” of highest-ever single game Wi-Fi data totals we’ve seen, behind only last year’s Super Bowl, an Alabama game at Texas A&M’s Kyle Field this fall that hit 5.7 TB, and (barely) last year’s college championship game. All eyes in the Wi-Fi totals world now turn to Levi’s Stadium, where Super Bowl 50 takes place Feb. 7. Will the 6.2 TB mark survive, maybe showing that fan data use at big games has peaked? Or will a new record be set? After just hosting a Super Bowl, one with record wireless traffic numbers, you might not think that the University of Phoenix Stadium in Glendale, Ariz., needed to upgrade its Wi-Fi and DAS networks. 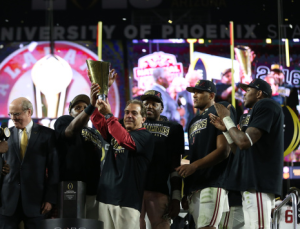 But with many more big events on the way soon, including hosting this season’s College Football Playoff championship game, the UoP Stadium isn’t sitting still, but instead is fine-tuning and expanding its networks to ensure fans stay connected as well as possible. 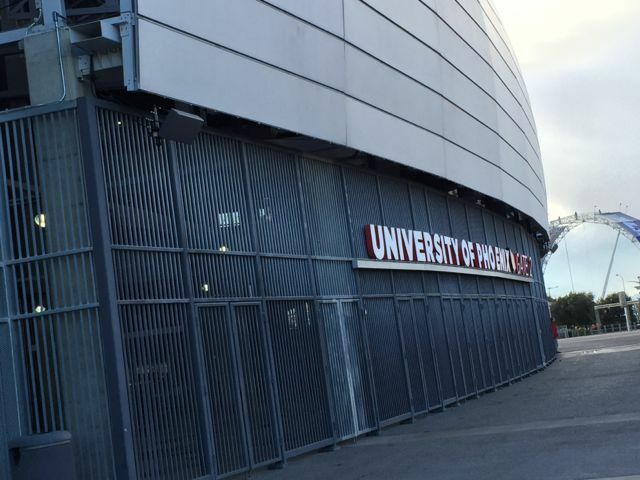 Outside UoP Stadium, where the architecture allows for DAS antenna placement under the fascia as well as behind speaker covers. 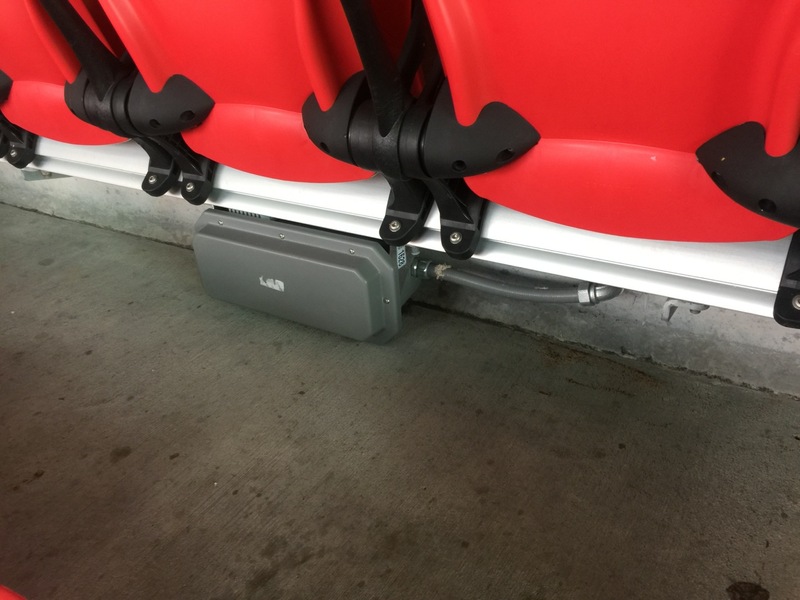 Inside the stadium, Feller said there are now Gimbal beacons deployed for “selective messaging” alerts that are tied to the stadium app. The team also added a separate Verizon Wireless SSID to its Wi-Fi mix, giving Verizon customers reserved bandwidth as well as the ability to autoconnect. The Wi-Fi network uses Cisco gear and is managed and supported by CDW. At the Cardinals’ most recent home game, a 26-18 win over the Baltimore Ravens on Oct. 26, the Wi-Fi network carried 1.445 terabytes of data, with 22,502 unique connections, according to numbers provided by Feller. Out of the 63,500-seat stadium a maximum number of 19,559 concurrent users was seen that day, with the top sites connected to by fans being Apple, Facebook, Google, iCloud, Yahoo, Instagram, Twitter and ESPN, according to Feller. There’s no small bit of irony in the fact that The Masters, one of the few places left on earth where you absolutely cannot carry a working cell phone, offers perhaps the best digital experience in all of sports. I’m biased, because I like golf and like the tradition and history of the Masters competition, but I would challenge you to find another event, team or league that offers the breadth and depth of the online/mobile experience brought forth by The Masters, CBS and IBM. With live competition beginning Thursday morning, I’m not worried that I won’t be next to a TV set for the excellent, mostly commercial-free broadcast (Thursday-Friday on ESPN, Saturday-Sunday on CBS). That’s because if I am online or on my phone I will have access to no fewer than five different live feeds from Augusta, including featured groups as well as focused coverage on “Amen Corner,” the classic stretch between the 11th and 13th holes of the famed Augusta National course. What makes the online and mobile experience so good? Production that parallels the TV broadcast, for one. No need for cable contract authorization, for another. 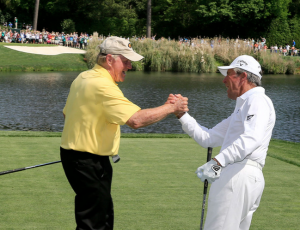 That The Masters is like Harvard with its endowments — and as such doesn’t need to pander to advertisers — is nirvana for all golf fans, but especially so for those of us who watch a lot of sports action these days online. While TV commercials are easily endured (or muted, or skipped) it seems of late that broadcasters are doing their best to reclaim eyeball turf online, by subjecting digital viewers to more and more invasive ads. During the recent NCAA Men’s Basketball Tournament there was a lot of praise for the online product, but nowhere did I see anyone report the fact we found out — that when you were watching online or on your phone, during commercials the Turner/NCAA folks kindly blocked your ability to mute the sound on the screen controls. On my phone during the great regional game between Kentucky and Notre Dame I also saw a small button with a Pizza Hut logo remain on the left side of the screen during play. You would never try that on a broadcast offering, but for many events it seems OK to smack the online viewers around for any profit possible. Anyway — when play starts Thursday just go to Masters.com or download the app, watch away and see if you don’t agree. If there’s another online experience that’s better, I’d like to hear about it. 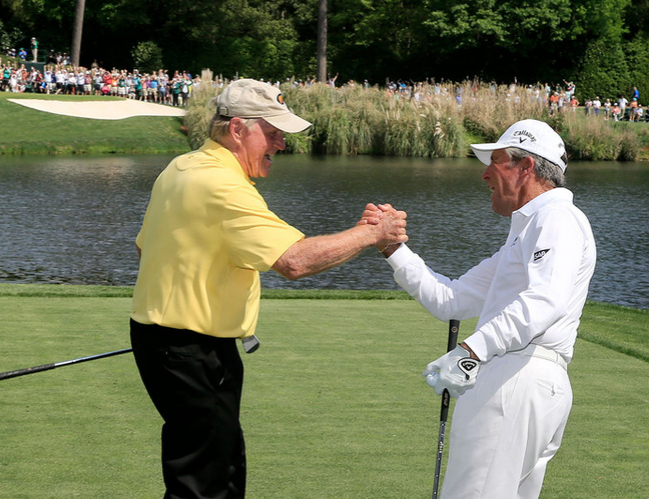 BONUS: Watch the Golden Bear back one up for a hole in one during the par 3 contest.